The popping bug illustrated below can be made from soft, light wood such as cedar or basswood. It should be about 1 1/2 in. long and 7/8 in. in diameter. The head slants downward at the regular 45-degree angle. You need two small screw-eyes and one treble hook to finish this bug. 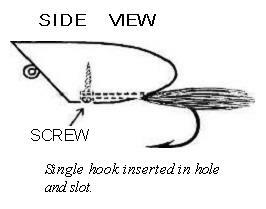 One screw eye goes at the head for the fishing line, while the other one holds the treble hook at the tail. The screw eyes and hooks should be smaller than those used for the regular freshwater fishing plugs; a No. 2 or No. 4 treble hook is a good size to use. The hooks should be sharp, fine-wire types of the best quality. You'll hook more fish with needle-sharp hooks than with dull, cheap ones. 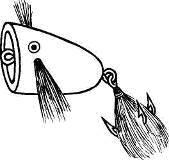 Before the treble hook is put on the screw eye it should be wound with bucktail hair, as shown below. 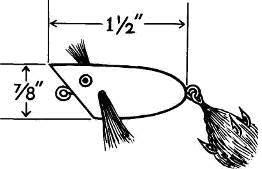 First cut your bucktail hair so that it is only slightly longer than the shank of the hook. Next, get some fly-tying thread and make a few turns with it around the hook shank near the eye. Now form three or four pinches of the bucktail hair and have them ready. Take one of the pinches of bucktail, lay it against the hook shank, and wind several turns of thread around it. Add another pinch of bucktail next to the first one and wind some thread around it. Keep doing this until the hook shank is completely covered by the bucktail. Finish off the wrapping with more turns and bind it with a whip finish or a series of half hitches. Then coat the thread wrapping with fly-tying cement or with one of the clear, quick-drying cements which come in tubes. 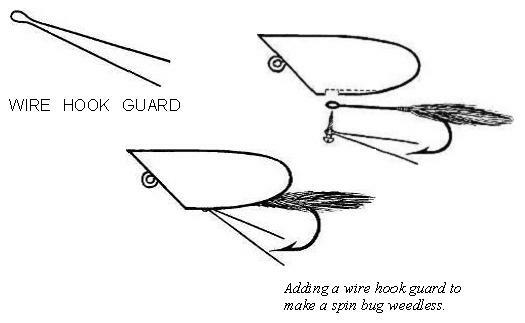 To make the wings of the spin bug which project from the sides, use bucktail or other hair. Take two pinches of the bucktail and wrap the butts tightly wih fly-tying thread, as shown below. Then dip or dab the wings with clear, waterproof cement. After they dry, drill two holes in the wood body of the bug, one on each side. When you do this, make sure that the holes are just big enough to take the butts of the bucktail wings snugly. In other words, it should be a tight fit. Then dip the butts of the wings in clear cement and insert them into the holes. You can also force a drop or two of the cement into the holes with a stick or brush. When the cement dries the bucktail wings will be held firmly in place. Another type of popping bug can be made, using the plug body of the popping plugs described for freshwater fishing. Only here you cut off the tail section so that the bug is short, as shown below. This bug can also have a treble hook wound with bucktail hair and wings at the sides. A third kind of popping bug is shown below. For this one you use the same size wooden body as the popping bug shown in the first illustration above. However, instead of attaching a free-swinging treble hook you add a single hook to the underside of the body. A regular shank hook about size No. 2/0 can be used. To attach this hook, first drill a shallow hole underneath the body, about half inch from the tail end. This hole should be large enough to take the round eye of the hook. The next step is to slit a narrow groove in the wood, running from the hole to the end of the body. This will accommodate the hook shank. See illustration below. Now wind some bucktail on the hook shank, about a half inch from the eye of the hook, then force the hook eye and shank into the hole and slot. After this, get a small screw and screw it through the hook eye. This will hold the hook firmly in place. See illustration below. Then get some plastic wood and fill up the hole and slit to conform to the round body shape of the bug. To complete the bug, wrap on two bucktail or feather wings on the top or sides of the bug body. The tying thread can be wound completely around the body. Then dab some clear cement on the winding and paint over this winding when the cement dries, so that it doesn't show. Such single hook spin bugs can easily be made weedless by adding a wire hook guard made from fine stainless steel or piano wire. Use a nail or thick wire to form the eye of the guard, as shown below. When making the single hook spin bug, this wire is slipped on the small screw first, then the hook. In other words, the same screw holds both the wire guard and the hook in place.